Birds Print Filled Cushion Pack of 2 is rated 4.8 out of 5 by 5. 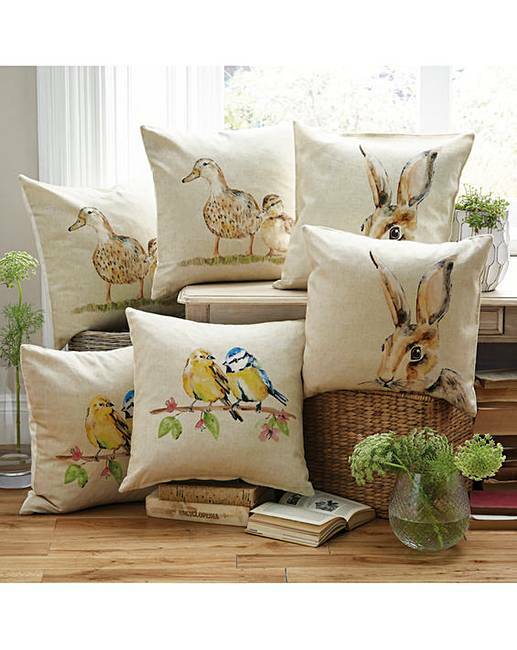 It’s not surprising they’ve caught your eye, our generously oversized cushions are the loveliest wildlife art we’ve seen. The effect is instant and stunning as they grace your home with country comfort. With a plump, bounce-back filling, the easy-care covers zip off for machine washing. Pack of two the same. Rated 4 out of 5 by Georgie from So attractive design. Absolutely delighted with these cushions. Such pretty colours and design. Rated 5 out of 5 by Margot from Little birds Exactly what I wanted for a chair in a child's bedroom. Rated 5 out of 5 by Crunchie from Beautiful cushions!!! I had these delivered two weeks ago and they are just lovely could not have asked for better colours.